HomeImprove the CXWhats the difference between customer experience and customer satisfaction? Todays leading marketers have customer experience top-of-mindand that makes perfect sense because customer experience is now driving the future of business. However, sometimes, when Im talking to marketers, I hear the terms customer experience, customer satisfaction and even customer service used interchangeably. Should we be thinking of these terms in the same way? Are they all equivalent? Customer experience, customer satisfaction and customer service are not the same. Let me help clear up the confusion. 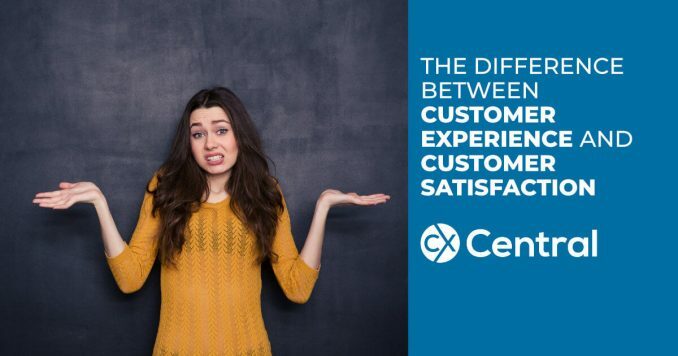 Customer experience (CX) is the sum of all experiences a customer has with a brand or product or company over the duration of the customers relationship with that brand or product or company. These days, customer experience involve a wide variety of channels, platforms and touchpointsfrom pre-purchase (awareness, research, attraction, interaction) to purchase, and then on to post-purchase (use, cultivation and advocacy). By contrast, customer satisfaction is more limited in scope. Customer satisfaction is a measure of how the products and services supplied by a company meet, surpass or fail customer expectations. In other words, customer satisfaction scores can help you determine where your customer experience is succeedingand where it needs improvement. Customer satisfaction scores help you better understand if people are pleased with your product. They can help you recognize whether or not you are delivering a truly seamless customer experience. So, customer experience and customer satisfaction are not exactly the same, even though they are intimately relatedand both increasingly essential for revenue growth. Clearly, retailers are past the stage of debating the importance of customer experience management. Now they have to master it. But dont get me wrong. No ones saying thats going to be easy. The multitude of online and offline touchpoints require true integration across systems and technologies to ensure consistency across the customer experience. Our research showed that the universe of retailer brands appreciate this necessity, with 97% citing integration of CX technology as important or essential to their growth. Unfortunately, only 40% describe their relevant systems as integrated and cross-functional. The goal of joining the varied technologies and data in the CX ecosystem is to get a full spectrum view in a way thats practically usefuland that, in turn, will improve customer experience, enhance customer service and boost customer satisfaction. If you need help defining your customer experience strategy or need help measuring your customer satisfaction you’ll find a range of suppliers in our Business Directory containing consultants, technology suppliers, Voice of the Customer programs and more.